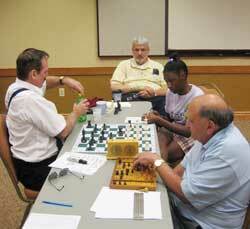 At the 2010 US Blind Championships in Pittsburgh, PA (October 11-12), Daniel Steininger of Indiana prevailed with a score of 4-0. Michael Allain of New Jersey and Albert Pietrolungo of Baltimore tied for second with 3-1. Olynick and Rosenkoetter finished with 2, and Alverson and Roda with 1. The gathering seemed to be unusually lively with hope and plans for the future. It was felt that a good site had been found, that the organization and direction were competent, that the USCF had been generous in coming up with about 1/2 the prize fund, that "new blood" had gratifyingly been recruited to play, and that next year, with a site and date known well ahead of time, there would be time and ability to do some real publicity. Steininger-Allain was a titanic struggle, which was ended on the 62nd move by a gross blunder in time pressure. Allain had Q and B and pawns against R and pawns, and was on the verge of mating, but allowed the queen to be skewered by a check from the rook. 1 e4 a6 2 d4 b5 3 Bd3 Bb7 4 f4 e6 5 Nf3 c5 6 c3 c4?! They teach you in grade school not to break the tension in this kind of setup. But Allain seems to play by his own rules as we will see. 7 Bc3 Nc6 8 O-O Nce7!?? 9 Qe2 Qb6 10 Be3 d5 11 e5 g6 12 Nbd2 Nf5 13 g4?! Patience is the word. I would expect 13 Bf2 followed by g3 and eventually h3, g4, etc. If there was still a kingside attack it's gone now, but there's still a game to be played. In the post-mortem Steininger regretted sending his queen off into the weeds. Now the game takes a terrifying turn. How will Black's king not get mated? Is there nothing better? In the post-mortem we could not find anything conclusive. 45...c3 46 Qc5+?? Qxc5 47 dxc5 Kb3! Both players were down to a couple of minutes. The players can ask the helpers how much time they have left, and they can even feel the clock face, which is "braille", but still, time pressure is more intense if you can't see. Here, 56 ... Bf3 intending ... Qg4 mate would do the job. 57 Kg2 Qxg5+ 58 Kf2 Qf4+ 59 Kg2 Bg4 60 Ra7 Qf3+ 61 Kg1 Bh3?? 62 Ra3+, Black resigns.